Let's Be Adventurers: Christmas Surprises! ...because the most exciting part of all is Christian (that sneaky devil) lured me down to Crystal Cove right on a beautiful stretch of Pacific coastline on Christmas Day (and made sure my 2 best friends were there too), and when the sunset was as colorful as could be...he popped the question! Too bad jetlag has gotten the best of me tonight and I'm exhausted. More details about the engagement coming soon! For now, I'll say it's been a great 2012 so far...me 'n my new fancy-shmancy fiance! Ahhhh congrats! 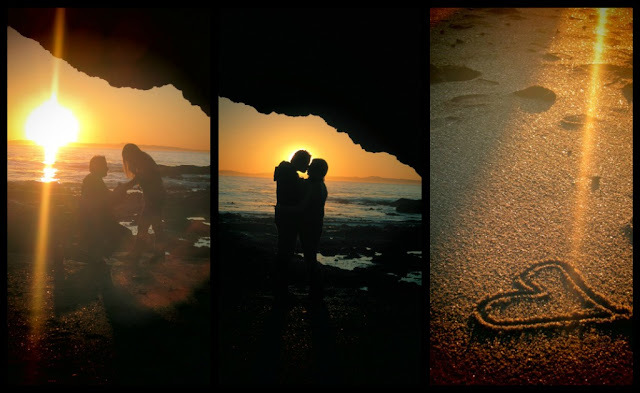 Crystal Cove is a beautiful place to get engaged. You lucky girl! So excited for you. Happy new year!